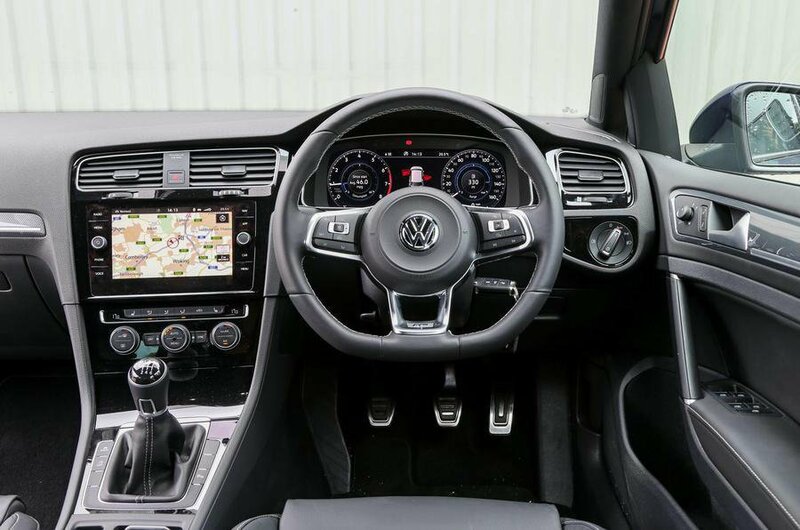 Volkswagen Golf Interior, Sat Nav, Dashboard | What Car? Whatever your shape or size, you should be able to find a comfortable driving position behind the wheel of a Golf. You get seat height adjustment, steering wheel rake and reach adjustment and a front centre armrest across the range, entry-level S being the only trim to miss out on adjustable lumbar support. Pedals that are neatly aligned with the steering wheel also help to provide a natural driving position. That said, taller drivers may find the steering wheel blocks their view of the instrument dials, and the 'comfort' seats that feature on many trims don't provide a huge amount of shoulder support. However, the figure-hugging seats found in sportier versions are very supportive and comfortable on longer jaunts. Once you’re are sitting comfortably, you’ll notice that all the buttons and knobs on the dashboard are well positioned, including physical climate dials that make it easy to tweak the temperature on the move. VW's Active Info display is an option on most models, and one that's well worth adding. It's 12.3in digital screen replaces conventional analog dials and can be set up to display a multitude of information in a clear and concise fashion. Few cars in this class offer better all-round visibility than the Golf, except perhaps the Audi A3. 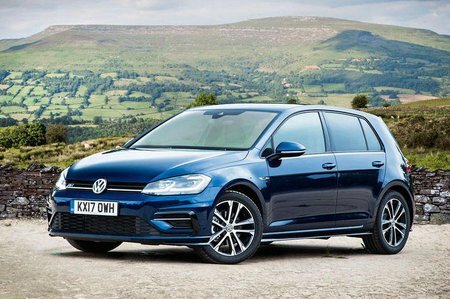 The Golf's windows are large and deep and the windscreen pillars relatively slim. As with most family cars, it's just the broad rear pillars that get in the way when you're looking over your shoulders. Front and rear parking sensors are standard on SE trim and above, and optional on the cheapest S trim. You can add a reversing camera to make parking even easier or, alternatively, the optional Park Assist system can practically do the job for you, steering the car into a space automatically while you simply control the car’s speed. Bright LED headlights are standard on the upper trim levels and are another option worth considering if you're ordering from lower down in the range. Every model, including entry-level S trim, gets at least an 8.0in high-definition, glass-fronted colour touchscreen. Either side of it are touch-sensitive shortcut buttons that allow you to flit between the sub-menus, as well as two rotary controls: one for volume and the other to scroll through lists or zoom in and out of maps (if sat-nav is fitted). These help it to be less distracting than many touchscreens when you're driving. It’s responsive and has usefully sized icons and the menus are easy to figure out, so you won't need to resort to the handbook to connect your phone or set the radio station presets. However, an annoying foible is how the screen automatically brings up extra icons when it senses your approaching hand. The good news is that you can disable this feature and leave those icons permanently displayed. However, the system doesn’t quite match the class-leading BMW iDrive you'll find in the 1 Series or Audi’s MMI that features in the A3. Every Golf has DAB radio, Bluetooth and a USB socket and the standard eight-speaker stereo produces a crisp, punchy sound and resists distortion well. SE trim adds Apple CarPlay and MirrorLink smartphone mirroring but you'll need to upgrade to Match trim or above to get built-in sat-nav. An optional upgraded system called Discover Navigation Pro brings a larger 9.2in screen. It also includes gesture control, which allows you to scroll through menus and change the radio stations or playlists using mid-air hand movements. The trouble is it doesn't respond how you expect most of the time — you end up looking like you're trying to swat away a fly — and as the package is such an expensive option, we wouldn't bother upgrading. The Golf’s interior is a cut above that of most family car rivals. Okay, it doesn’t feel as special inside as the Audi A3 — the plastics in the lower reaches of the cabin are harder and the switches don’t operate with quite the same precision — or as imaginatively designed as the Mercedes A-Class. The materials in your eye-line look and feel classy enough, though, with lots of tactile, soft-touch plastics in areas where fingers tend to roam. Everything feels solidly bolted together, too, and overall it’s a much classier effort than the Ford Focus and Seat Leon.